Joseph Daniel "Joey" Votto (born September 10, 1983) is a Canadian professional baseball first baseman for the Cincinnati Reds of Major League Baseball (MLB). He made his MLB debut with the Reds in 2007. Votto is a four-time MLB All-Star and a six-time Tip O'Neill Award winner. In 2010, he won the National League (NL) MVP Award, the NL Hank Aaron Award, and the Lou Marsh Trophy as Canada's athlete of the year. 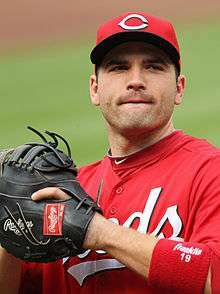 Votto was born on September 10, 1983 to Wendy (Howell) and Joseph Votto in Toronto, Ontario, and grew up in Etobicoke, a district in the west end of Toronto. His mother is a sommelier and restaurant manager. His father was a chef and a baseball fan who died at age 52 in 2008. He is of Italian descent. As a child, he adorned his wall with a Ted Williams poster. Votto enrolled in high school at Richview Collegiate Institute in 1997. In high school, he also played basketball — playing point guard and once scoring 37 points in a game — and hockey. He played for the Etobicoke Rangers baseball program. Votto signed a National Letter of Intent to play college baseball for the Coastal Carolina Chanticleers after high school. Votto was drafted out of high school in the second round of the 2002 MLB amateur draft by the Reds (44th overall), After his first two professional seasons with the Reds' rookie-level affiliates, he burst onto the scene in 2004 with the Class A Dayton Dragons, hitting 26 doubles and 14 home runs with a batting average of .302. He was promoted to the Class A-Advanced Potomac and hit five more home runs in 20 games to end the season with 19. During his time in the minor leagues, Votto made appearances in the outfield and as a catcher, aside from first base. Votto's consistency declined during 2005 campaign with Sarasota. While he still hit 19 home runs, he struck out 122 times and his batting average dropped nearly 50 points to .256. Votto rebounded in 2006 with the best season of his minor league career. Playing with Class AA Chattanooga, he improved his batting average to .319 and hit 46 doubles and 22 home runs. He led the Southern League in batting average and total bases and was third in home runs and RBI. He was selected to play in the 2006 Futures Game on the World Team. He was named to both the Mid-Season and Post-Season Southern League All-Star teams, and was voted a minor league all-star by Baseball America. He culminated his season by winning the Southern League Most Valuable Player Award. During his five seasons in the minors, Votto carried Ted Williams' The Science of Hitting with him. Votto started off the 2007 season playing in Triple-A for the Louisville Bats. He was called up on September 1, 2007. He made his Major League debut on September 4, 2007, striking out against Guillermo Mota of the New York Mets. In his second major league at-bat, he hit his first career home run. He went 3-for-5 and scored two runs as the Reds won the game, 7–0. On September 8, he went 1-for-3 with a home run and three runs batted in. His three RBIs were the only Reds' runs as they lost to the Milwaukee Brewers, 4–3. In his next game, he went 2-for-4. On September 14, he stole his first career base against the Brewers. 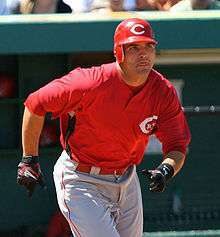 He ended the season going 2-for-4 with a home run and five RBIs in the Cincinnati Reds' final game of the 2007 season. He would finish the season batting .321 with 4 home runs and 17 runs batted in. Beginning with the 2008 season, Votto shared time platooning at first base with Scott Hatteberg until Manager Dusty Baker began playing Votto as the Reds' starting first baseman in early April. On April 15, he hit his first home run of the season off of Michael Wuertz. He drove in a career-high five runs against the Cubs two games later. On May 7, Votto hit three home runs in a game against the Chicago Cubs. "I'm like a kid", said Votto, a second-year player who had never hit more than one in a game. "I thought it was cool. It's not a big part of my game." Votto hit his first career pinch-hit home run against Cleveland's Cliff Lee, who would go on to win the AL Cy Young Award. On August 31, Votto had his first career four-hit game against the San Francisco Giants. He knocked in 4 runs in a 9–3 Reds victory. On September 18, Votto and teammate Jay Bruce each homered twice. They became the fifth rookie teammates in the divisional-era to hit 20 home runs in the same season. Votto finished second in National League Rookie of the Year voting to the Chicago Cubs' Geovany Soto. He led all NL rookies in hitting (.297), hits (156), HR (24), total bases (266), multi-hit games (42), on-base percentage (.368) and slugging percentage (.506). Votto also broke the Reds' record for the most runs batted in by a rookie in a season. The previous record was held by National Baseball Hall of Fame outfielder Frank Robinson with 83 in 1956. Votto drove in 84 runs during the 2008 season. Votto began the 2009 season strong as the outright starter at first base. In the second game of the season, he went 3-for-5 with a homer and three RBI in a loss to the New York Mets. In the next game against the Mets, he had another homer and four RBI. He had a six-game hitting streak from April 12–18. On April 23, he went 4-for-5 with a home run and two runs batted in against the Cubs. He ended out with a .346 batting average, 3 home runs, and 20 runs batted in in the month of April. Votto made his return against the Toronto Blue Jays on June 23. In his third game back, he went 4-for-5 with a home run and four runs batted in. After going hitless in his fourth game back, he had a 14-game hitting streak. During that stretch, he batted .389 with three home runs and 14 runs batted in. His hitting streak ended against the Mets on July 12 when he went 0-for-2. Votto was named the National League Player of the Week for September 21–27, 2009 after hitting 10 doubles in a five-game span, a feat not accomplished in 77 years since Hall of Fame outfielder Paul Waner of the Pittsburgh Pirates in 1932. Despite missing 31 games overall, Votto finished the 2009 season among the National League leaders in batting average (.322), on-base percentage (.414) and slugging percentage (.567) and he hit 25 home runs. Votto started the 2010 season by going 3-for-5 with a home run and a run batted in. By the end of April, he had four home runs and 12 runs batted in. His average was .275 but his on-base percentage was .400 due to 18 bases on balls. Votto played better in the month of May. He batted .344 with six home runs and 21 runs batted in. However, he missed the last six games that month due to a sore neck. He would be back on June 1 in a game against the Cardinals. He went 4-for-5 with a home run and a run batted in. The Reds won the game to regain the NL Central lead. Votto was not initially voted to the 2010 All-Star game in Anaheim, California, but made the roster via online fan voting through the National League's Final Vote. He was named on 13.7 million of the 26 million ballots submitted. Votto went 0-for-2 in the game. On August 25, Votto went 4-for-7 with two home runs and four RBI. He also drove in the tie-breaking run with a single off Giants pitcher Barry Zito. Votto made the cover of Sports Illustrated on the August 30, 2010 edition. 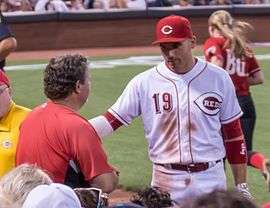 On September 11, Votto hit his first career walk-off home run off Pirates relief pitcher Justin Thomas. For the season, Votto hit .324 with 113 RBIs, 106 runs scored and 37 homers, including a grand slam off Tommy Hanson of the Atlanta Braves on May 20. He finished the season leading the Major Leagues in On-Base Percentage (.424) and led the National League in Slugging Percentage (.600) and On-Base Plus Slugging (1.024). The Reds made the postseason but lost to the Phillies in the National League Divisional Series in a three-game sweep. Votto struggled in the series, batting .091 with one run batted in. Votto won the 2010 Hank Aaron Award in the National League. Votto was announced as the 2010 NL MVP, coming within one vote of winning unanimously as Albert Pujols received the other first-place vote. He was only the third Canadian to win the MVP award, after Larry Walker and Justin Morneau. He became the first Reds player to win the National League MVP since Barry Larkin won it in 1995. "Not to be dramatic or anything, but after I was told, I couldn't help but cry because I know how much at some point this meant to me and would have meant to my (late) father", Votto remarked after being named MVP. He added, "I did some pretty good things, and most importantly, we won. We went to the playoffs – it's been a long time since we'd been to the playoffs – and I think those all together were the reason I won." On May 13, Votto went 4 -for-5 with three home runs and six RBI, including a walk-off grand slam against the Washington Nationals in a 9–6 win. It was the first time in major league history that a player hit three home runs including a walk-off grand slam in a single game. On July 1, Votto was selected by the fans as a National League team starter in the 2012 MLB All-Star Game. At the time of his selection, he was hitting .350 with 14 home runs and 47 RBI. On September 5, Votto returned to the Reds' lineup in a game against the Philadelphia Phillies. In his first at-bat since July 15, he lined a single off pitcher Roy Halladay in the first inning. He would finish the game by 2-for-3 with a base on balls. After his return from the disabled list, he struggled with his power numbers. In 25 games, he hit eight doubles but no home runs and drove in seven runs. He still got on base at a high clip at .505, walking 28 times. In that span, he also batted over .316. In late February, Votto was voted by fans as the "Face of the MLB", a contest that pits the "Face" of every MLB team against each other and is voted on using Twitter. He received more votes than Joe Mauer, Jose Bautista, Derek Jeter, Andrew McCutchen and Matt Kemp. Votto homered on consecutive days from April 20–21 against the Marlins, making it the first time since September 10–11 of 2011 he homered in consecutive games. In July, he was again voted as an All-Star starter for the 2013 Major League Baseball All-Star Game. It was his fourth All-Star appearance, and in the game he went 0-for-2, making him a career 0-for-9 in All-Star Games. On May 21, 2014, Votto was placed on the 15-day disabled list with a strained left quadriceps. He returned on June 10 but went back on the DL with the same injury on July 8 and didn't make it back before the end of the season. In 62 games played, he hit a career-low .255 with a .390 on-base percentage, .409 slugging percentage, 6 home runs, 47 walks, and 23 runs batted in. On June 9, Votto hit three home runs in a single game for the third time in his career in a game against the Philadelphia Phillies, a feat last accomplished by a Red by Johnny Bench. On August 2, Votto was ejected following a bench-clearing brawl between the Reds and the Pirates. On September 10, Votto was ejected for arguing balls and strikes. It was the third time of the season that Votto was ejected, coincidentally all three times have been against the Pittsburgh Pirates. On September 11, MLB suspended Votto 2 games with an option to appeal. On October 2, Votto tied a Reds record set by Pete Rose in 1978 when he got on base for his 48th straight game. In 158 games of 2015, Votto had an MLB-leading 143 walks, a .314 batting average, 29 home runs, and 80 RBI. After an abysmal start to the 2016 season, hitting a season-low .213 on May 31, Votto became the first player in MLB since Ichiro Suzuki in 2004 to hit .400 after the All-Star Break. Votto hit .408/.490/.668 in the second half. Votto's .326 season average was the second-best of his career, behind only his 2012 season, where he hit .337. Votto hit 29 home runs, second only to his 2010 MVP season. Votto finished the season with a .326/.435/.550 line with 108 walks, 29 home runs, and 97 RBI, playing 158 games for the second straight season. Votto is known for being a clutch hitter. Through June 9, 2014, he had a career .312 batting average, 163 home runs, and 542 runs batted in. He has been known to show great patience at the plate. He led the NL in base on balls with 110 in 2011 and did it again in 2012, with 94, despite missing 51 games. His career on-base percentage is .425. He led the NL in that category from 2010-13 and 2016, while finishing second in 2015, one point behind Bryce Harper's .460 OBP. Votto lives in Mount Adams, Cincinnati. He has three brothers; Tyler, and twin brothers named Ryan and Paul who now attend North Park Secondary School in Brampton, Ontario. Votto's adopted mastiff-golden retriever mix is named "Maris", after former baseball player Roger Maris. Votto is represented by sports agent Dan Lozano. ↑ "Votto wins Lou Marsh Award as Canada's athlete of the year". Globe and Mail. Toronto. December 15, 2010. Retrieved December 15, 2010. ↑ "Joseph Votto". The Windsor Star. Retrieved December 4, 2015. ↑ Sheldon, Mark (June 23, 2009). "Votto: 'I felt I was going to die'". MLB.com. 1 2 Verducci, Tom (July 17, 2012). "Votto's injury could lead to changes for Reds, NL Central race". SportsIllustrated.CNN.com. Retrieved July 18, 2012. ↑ Morgan Campbell (October 15, 2015). "Joey Votto: The reason Richview roots for red". TheStar.com. ↑ Seguin, Chanelle (October 12, 2011). "Joey Votto a former Etobicoke Ranger". Humber Etcetera. Retrieved April 12, 2013. ↑ Puskar, Gene J. (June 27, 2015). "Former CCU recruits Matz, Votto to square off in Mets-Reds game". Myrtle Beach Online. Sun News. Retrieved 6 November 2015. ↑ "Reds close out season with a victory". MLB.com. Retrieved September 8, 2008. ↑ "Reds ride four-homer second inning past Lieber, Cubs". Espn.com. Associated Press. June 9, 2013. Retrieved June 9, 2013. ↑ "Votto, Bruce lead Reds' home run barrage; Brewers lose 14th September game". Espn.com. Associated Press. June 9, 2013. Retrieved June 9, 2013. 1 2 3 4 5 6 7 8 9 "Joey Votto Statistics and History". Baseball-Reference.com. Baseball-Reference.com. Associated Press. June 3, 2013. Retrieved June 3, 2013. 1 2 3 "Joey Votto 2009 Batting Gamelogs". Baseball-Reference.com. Associated Press. June 9, 2013. Retrieved June 9, 2013. ↑ "Joey Votto 2009 Battling Splits". Baseball-Reference.com. Associated Press. June 9, 2013. Retrieved June 9, 2013. ↑ Canoe inc. "'I thought I was going to die'". canoe.com. ↑ "Votto earns NL Player of Week honor". Cincinnati Reds. ↑ Newman, Mark (July 8, 2010). "Votto, Swisher win tight Final Vote". MLB.com. Retrieved July 8, 2010. ↑ "Reds recover from blown nine-run lead to beat Giants in 12". Espn.com. Associated Press. June 9, 2013. Retrieved June 9, 2013. ↑ "2011 Cincinnati Reds Batting, Pitching, and Fielding Statistics". Baseball-Reference.com. Associated Press. June 3, 2013. Retrieved June 3, 2013. ↑ Ortiz, Jorge L. (October 31, 2010). "Jose Bautista and Joey Votto named recipients of Hank Aaron Award". USA Today. 1 2 Ortiz, Jorge L. (November 22, 2012). "Reds slugger Joey Votto wins National League MVP". USA Today. Retrieved July 18, 2012. ↑ "Joey Votto hits two homers as Reds outslug Orioles". Espn.com. Associated Press. June 9, 2013. Retrieved June 9, 2013. ↑ "Josh Harrison, Pirates assure Reds of losing season". Espn.com. Associated Press. June 9, 2013. Retrieved June 9, 2013. ↑ "Joey Votto agrees to 10-year, $225 million deal with Reds". USA Today. April 2, 2012. 1 2 3 4 Elliot, Bob (April 14, 2012). "Joey Votto: Legend in the making". Toronto Sun. Retrieved June 29, 2013. ↑ "Joey Votto agrees to 10-year deal". ESPN.com. April 4, 2012. Retrieved June 29, 2013. ↑ Kay, Joe (May 13, 2012). "Joey Votto Hits Walk-Off Grand Slam Slam: Reds Star's 3 Home Runs Lifts Reds Past Nationals 9–6 (VIDEO)". The Huffington Post. ↑ Sanchez, Jesse (July 1, 2012). "Rosters unveild for 83rd All-Star Game". MLB.com. Retrieved July 2, 2012. ↑ "Cincinnati Reds' Joey Votto needs knee surgery, will miss 3–4 weeks". ↑ "Votto out 3–4 weeks for knee surgery". SportsIllustrated.CNN.com. AP. July 16, 2012. Retrieved July 17, 2012. ↑ Sheldon, Mark (June 30, 2012). "Latos keeps rolling with gem against Giants". MLB.com. Retrieved July 17, 2012. 1 2 Fay, John (July 17, 2012). "Joey Votto to have knee surgery, miss 3–4 weeks". Cincinnati Enquirer. Retrieved July 17, 2012. ↑ "Phillies back Roy Halladay with 2 homers, rout Reds". Espn.com. Associated Press. June 9, 2013. Retrieved June 9, 2013. ↑ "Joey Votto 2012 Batting Splits". Baseball-Reference.com. Baseball-Reference.com. Associated Press. June 3, 2013. Retrieved June 3, 2013. ↑ "Joey Votto Stats". ESPN.com. ↑ "Joey Votto homers again as Reds throttle Marlins". Espn.com. Associated Press. June 9, 2013. Retrieved June 9, 2013. ↑ "All-Star Games: Tuesday, July 16, 2013, 8:00PM, Citi Field". Baseball-Reference.com. ↑ Snyder, Matt. "Votto ejected, bumps umpire.". CBS Sports. Retrieved May 6, 2015. ↑ Kay, Joe (June 9, 2015). "Votto blasts three home runs in same game". Fox Sports. Retrieved June 9, 2015. ↑ "WATCH: Benches clear in Blue Jays-Royals, Pirates-Reds games". CBSSports.com. Retrieved December 4, 2015. ↑ "Reds' Joey Votto completely loses it after getting ejected in Pirates game – For The Win". For The Win. Retrieved December 4, 2015. ↑ Sheldon, Mark. "Votto suspended 2 games, will appeal.". MLB. Retrieved September 11, 2015. 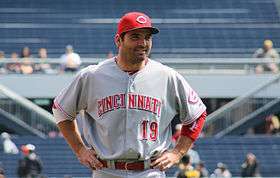 ↑ "Joey Votto ties Pete Rose's Reds mark with 48 straight games on base". CBSSports.com. Retrieved December 4, 2015. ↑ "Toronto-born Reds first baseman wins Canadian Baseball Hall of Fame award". CTV News. The Canadian Press. December 4, 2015. Retrieved December 4, 2015. 1 2 "Joey Votto Stats, Fantasy & News". Cincinnati Reds. Retrieved 2016-10-03. ↑ Ortiz, Jorge (July 2, 2012). "Reds slugger Joey Votto learns balance and power". USA Today. Retrieved July 3, 2012.